Priceline Travel Insurance is overpriced and with poor cover levels. The cover is actually provided by Allianz, which explains the high costs. Customers will find much better options by quickly shopping around. 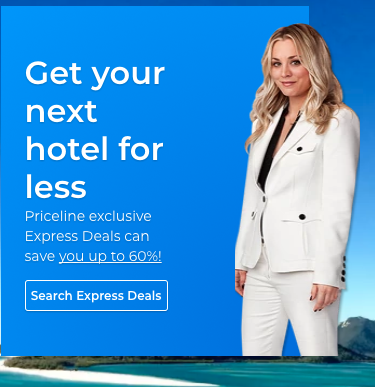 Use Priceline for Travel. 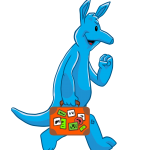 Use AardvarkCompare for Travel Insurance. Simple. Priceline does an excellent job in introducing customers to a wide range of flight options. We love its site. The user-interface is intuitive, and responds very quickly. We find it easy to find low-cost options whenever we look to fly. 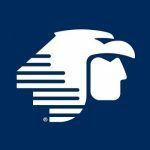 So it is pretty frustrating that when a traveler gets presented with Priceline Trip Insurance, there is only one choice, and it is not low-cost. In fact, it is pretty terrible. Let’s take a look at the Priceline experience. Priceline excels in showing a variety of flights over the same day in order to give a customer best value. Our only gripe is that Priceline does not provide a multi-day grid in order to highlight whether a change of date would lead to lower flight prices. 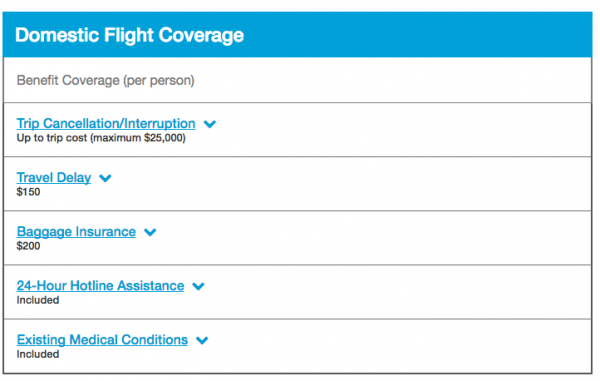 Many airlines are offering this type of functionality, and we are big fans of it. We chose the least expensive Business Class seat. It’s a long trip, and we wanted to treat ourselves. 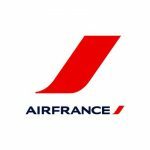 The flight was competitively priced at $974. 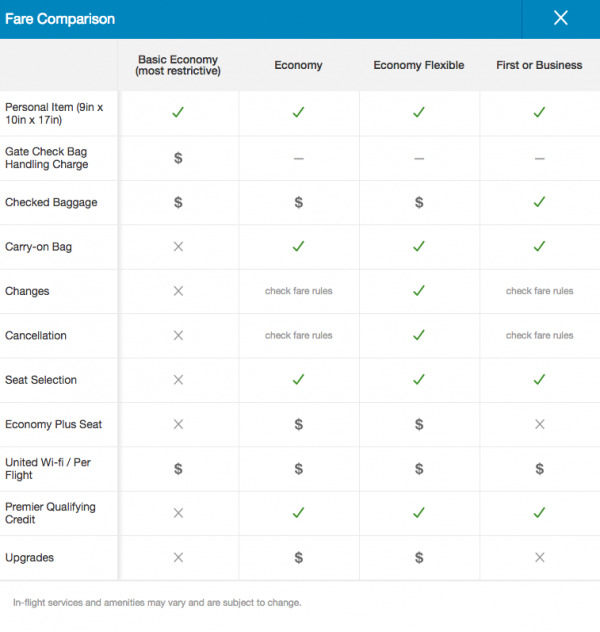 Priceline offers an excellent pop-up fare comparison chart in order to see the benefits of moving from one seat class to another. 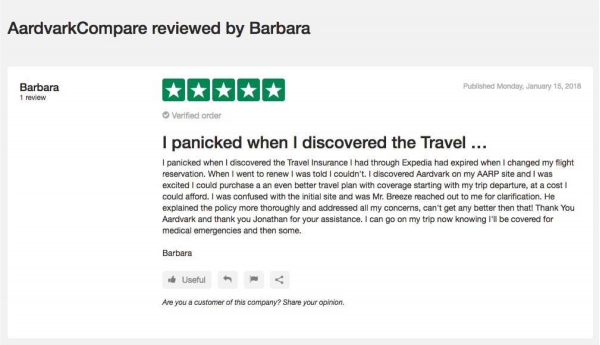 We see this more and more from travel sites – a hard push to sell travel insurance on check-out. Here the language used by Priceline Travel Insurance is that you either take Priceline flight cover or ‘No, I’ll take my chances’. We certainly don’t approve of that type of language, particularly given the very weak level of cover that Priceline Trip Insurance actually offers. 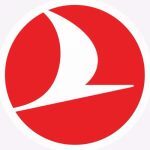 Priceline Domestic Flight Cover – Where’s the Cover?! Flight insurance from Priceline is offered as either Domestic or International. There are differences in cover between the two. 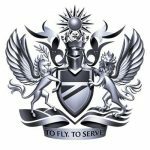 Looking first at the insurance cover provided for a Domestic flight. Priceline’s $56 of trip insurance cover will help us if we cancel for a serious medical reason. We will get a little compensation for a flight delay or if a bag is lost. This may be the skinniest travel insurance plan that we have seen in a long time. What if you get sick? Where is the medical cover? How are you going to get home if you need a medical evacuation? 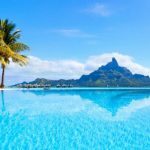 What if you need to cancel because your vacation was cancelled by your employer? 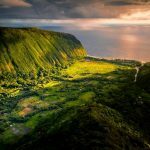 These are the sorts of benefits that we see in almost every comprehensive travel insurance plan, so it is baffling that Priceline Trip Insurance excludes these. Now, we know that most people have health insurance. But, how many of us have health insurance that works out-of-network and out-of-state without crippling additional costs? That is why many people want travel insurance for domestic travel. It’s supposed to help with insane medical bills. The Priceline policy has no health cover in the USA. We think that this is really poor. Customers should think very carefully. Our job at AardvarkCompare is pretty simple. 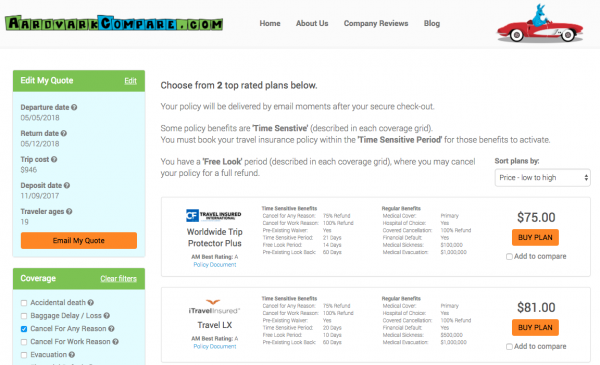 We do for travel insurance what Priceline does for flights. Give us your trip details, and get quotes from each of our travel insurance partners. We do it anonymously – your details are not shared with the insurer until you buy a policy. If comparing the market for flights makes sense, why wouldn’t you do the same for your travel insurance? You’ll see the best cover and the lowest prices. 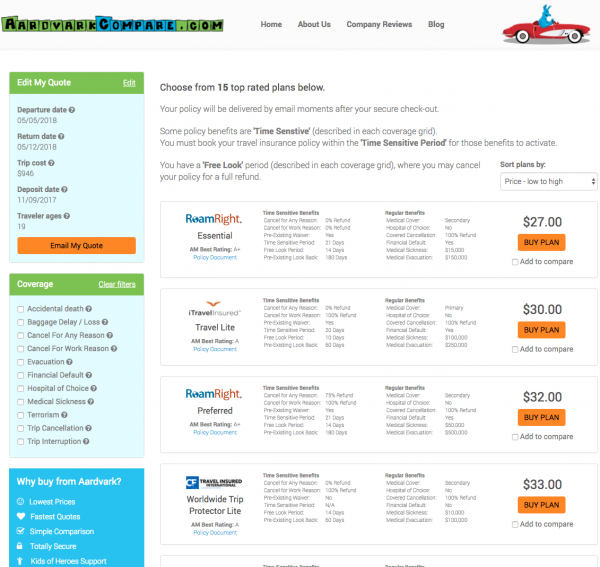 Here’s what we pulled when we ran a quote for our Priceline flight. It took less than a minute. We offer a number of low-cost plans. But the iTI Lite plan gains a great deal of interest. It is certainly low-cost, with high benefits. The Cancel for Work cover is important for many of us. Typically, low-cost plans do not have such cover, hence our recommendation of it to our customers. Why is Cancel for Work helpful? Imagine that your employer canceled your vacation. With Cancel for Work cover you can get a 100% refund. Take a moment, if you will. Our plan from iTI is half the price, yet has comprehensive medical benefits. It has some of the best ‘Cancel for Work’ reasons cover available. At Half the Price of the Priceline Flight Insurance. You really should shop around before you think of buying Priceline Travel Insurance. Now let’s imagine that we get to travel out of the USA. 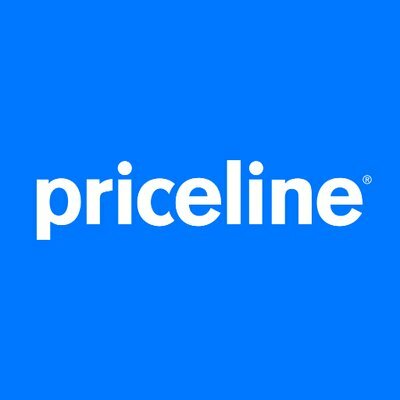 How does Priceline Travel Insurance support us in this case? Well, now we are looking at Priceline International Flight Insurance. Here’s the flight we were checking. San Francisco to London. $946 return. 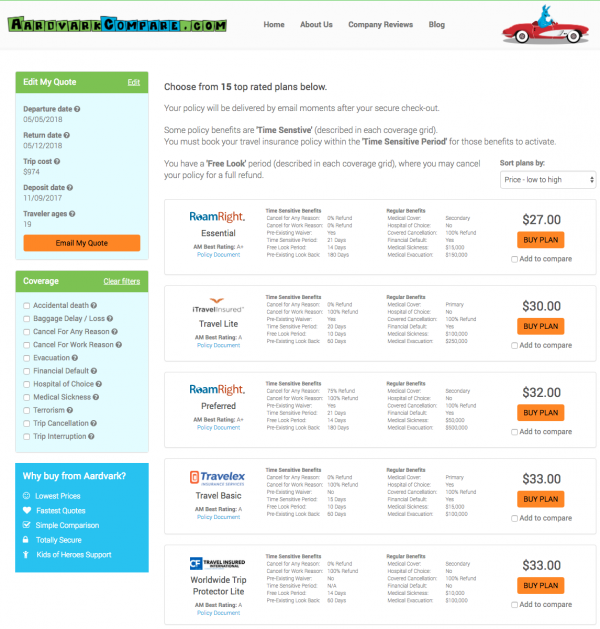 Priceline wishes to charge us $62 for its Priceline Trip Protection plan. Again, it is provided by Allianz. And, again, it is mind-numbingly expensive with super-weak coverage. Let’s take a quick look in order to see the level of cover available to a Priceline customer. Standard Trip Cancellation is covered. Emergency Medical has $10k of cover. Emergency Medical Transportation has $25k of cover. A hospital can cost $4k per day, and emergency transport home can comfortably cost $100k. So, the levels of travel medical insurance protection offered by the Priceline policy is woefully inadequate for most travelers. Unless a traveler has their own travel medical plan that would cover costs above those of Priceline, we would always recommend more cover. Travel Medical Insurance is critically important. CDC has some excellent advice. Remember, the policies that we share with our travelers are not ‘ours’. We did not create them. All we do is bring quotes from the multitude of travel insurance partners that we work with. Then you have the choice as to which policy will suit your needs. We offer a number of low-cost plans. But, again, the iTI Lite plan gains most interest. 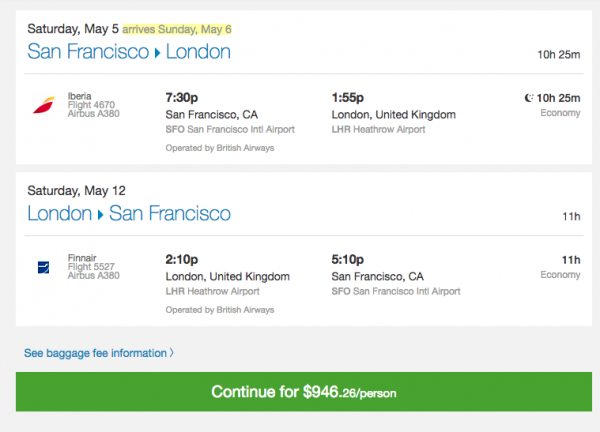 It is certainly low-cost – again, only $30 for this flight. Now, compare it with the Priceline Flight Insurance. The iTI Policy is half the price of Priceline insurance, with 10 times the level of cover. There is no logic to buying the Priceline policy in this case. Priceline is expensive, with very weak cover. Certainly Priceline is not a low-cost flight insurance. Rather, Priceline is a low-cover flight insurance, and that seems pointless. But what if a customer wanted to pay more for their travel insurance? Are there more comprehensive levels of cover available? With Cancel for Work cover, we have cover in case of work-related cancellation. But perhaps we just want to change our minds and not travel anymore? How could we get some form of refund? That is where Cancel for Any Reason cover comes in. 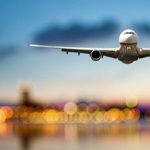 The use of Cancel for Any Reason insurance to lower ticket prices has been described as the Airline Ticket Hack. The iTI Travel LX is a little more expensive at $81, but has much higher Medical Cover. We would probably take the Travel LX in this case, just for the higher cover levels. We love Amazon and are fans of Priceline’s flight comparison tools. Comparison-shopping is simple.